I’d like to take a look at what I think is the biggest pitfall authors face, especially if they are not hiring a professional to design a book cover for them. Though many authors don’t appear to know, there’s one thing to bear in mind. COPYRIGHT is LAW! Here are 5 important things you need to think about when it comes to copyright. 1. Assume everything is copyrighted by someone. Absolutely nothing is available for you to use for free or without permission, unless *specifically* stated by the copyright holder. I drew this while sipping my morning coffee. It had copyright protection the moment I put pen to paper. In addition, the photograph I took of it also had copyright protection the moment I pushed the shutter button. Just like the words in your book, no one may legally use it for anything without my explicit permission, or paying me for it’s use. 2. As soon as the shutter goes “click”, the photographer has a copyright on that photo. 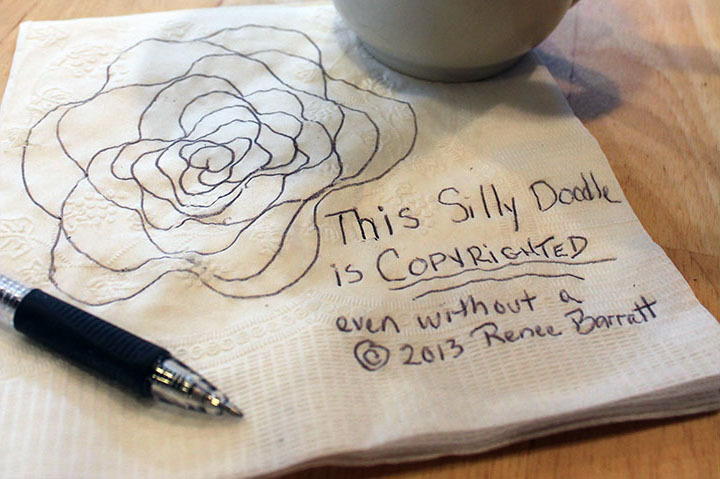 As soon as you doodle something on your napkin at lunch, you have a copyright on that doodle. With a non-registered copyright, the copyright holder may only sue for actual damages, which are usually standard licensing fees and any profits lost. In the US, if the photographer or artist who owns the copyright to an image that is used without permission has taken the extra time to register it with the US Copyright Office, they could actually sue someone for statutory damages. That amount is usually significantly more than actual loss. 3. 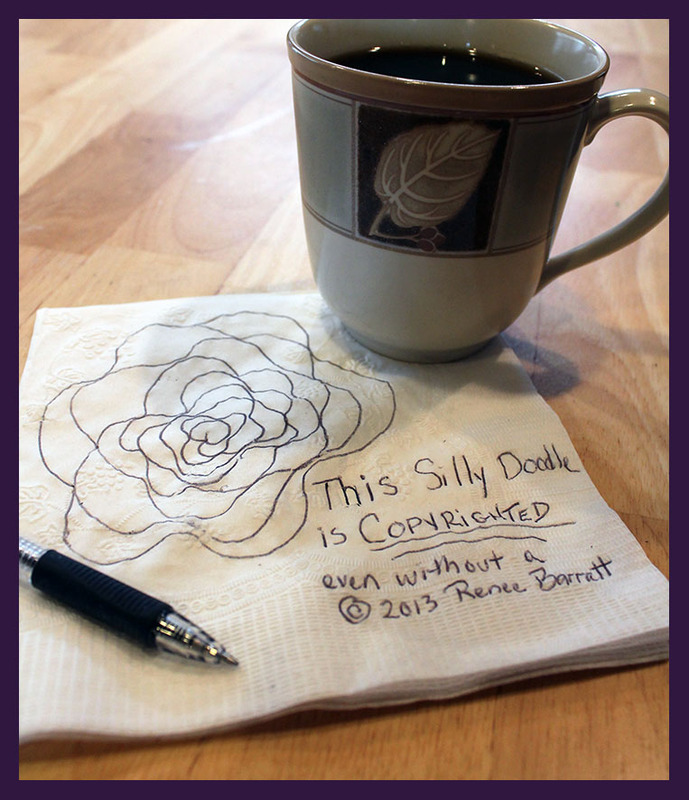 It is NOT necessary for a photo to have any indication of copyright. It is copyrighted automatically because it exists and someone created it. However, it’s important to know that there can be a HUGE fine for removing copyright management information, including physical and digital watermarks. This is covered under The Digital Millennium Copyright Act section 1202 and fines can range from $2500 to $25000 PER VIOLATION. 4. If you haven’t received specific permission, or purchased the rights to use a piece of photography or art for any project, book covers, business cards, Blogs, Facebook pages, you are in violation of copyright law. 5. There are plenty of places to find Photos and art that you can purchase a license to use for a small fee (sometimes as little as $1, depending on your needs). Otherwise, if you find something you like, find out where it came from and who created it and ASK. Sometimes new artists will allow you to use their photos and art for almost free (or completely free). Others might tell you it costs way more than you have the budget to pay. Either way, it’s absolutely worth asking! You’ll find many artists who will say yes! But if you are not successful in tracking down the original artist, please, find something else. If you can’t find an image’s origin, DON’T USE IT. Unfortunately, ignorance is not an excuse and will not save you from potentially having to pay lots of money in fines. and find beautiful things to dress your book in…. But remember, always wear copyright protection.